Josh Trent, digital health coach and wellness technology expert, interviews ​global leaders in the areas of behavior change, health, wellness technology and fitness, to empower you with the knowledge and tools on how to take the best action in transforming your mindset, your body, and ultimately your life! 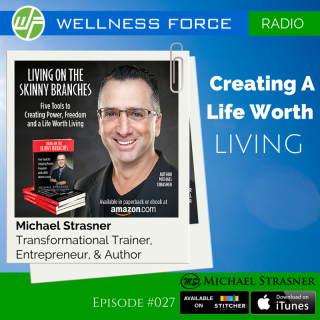 “Today I’m both excited and honored to have one of the most respected leading experts in personal transformation, Michael Strasner. During the last 30 years, he has worked with over a 100 thousand students and people from all over the United States, South America, and Europe. Through his mastery of coaching and understanding the psychology of leadership and human behavior, he has been able to facilitate and design extraordinary workshops dedicated to the art of life and living on the Skinny Branches. He’s been a featured guest in newspaper articles, podcasts, and radio shows, sharing his expertise on such diverse topics as effective communication, connection and intimacy in relationships, building self-esteem, the power of authenticity, personality adapting through style flexing, powerful and impactful public speaking, and jump-starting your passion for life. His personal vision is to create a world of peace, love,unity, and abundance. This is reflected in the work he does in the domain of personal transformational training. He has also authored several workshops: Mastering the Art of Relationship, The Entrepreneurial Mind, Mastering Leadership for Teenagers, The Masters Course, and the highly regarded L.P. Ph.D. Program.